I have to say that the Pleasure Puss experience has been exactly that - very Pleasurable!! I have not felt so comfortable during my period for years - and it is really nice to not have to pay so much for pads every month - Anjoli The pleasure puss pads are great, I am a complete convert, no more disposable pads for me. I have recommended your site to others who are interested and would be happy to do so again. - Toni It was certainly more absorbent and I felt very comfortable wearing it. Then came the cleanup ... soaked in cold water and thrown in the wash with everything else it came up without a stain ... it looked brand new again - Helen It was as if my body knew that something special had arrived. I used the cloth pads last week and they were great especially the soft flannlette one! - Petra I love my Pleasure Puss pads. They are so easy to wash. I bought a container to soak them in the bathroom and then straight into the washing machine. Can't get much easier than that. - Sue I am extremely happy with them, they are really easy to look after, and I am trying to convert all of my friends :) I couldn't be happier with the service I got from you guys, I will definitely be ordering some more in the near future :) Thank you for such a great product! - Anjoli It is really nice not to have any accidental bikini waxing from adhesive wings that have come loose. They feel comfortable and I am not getting sweaty and itchy like when I wear disposables - Helen I have now been using Pleasure Puss Pads for over 6 months and I want to tell everyone I meet how good they are! They are comfortable to the point where, when I first started using them I forgot they were there - secure, easy to wash and dry with very little staining, even on the white pads. I was growing tired of the disposable pads making me dry and unbalanced. The Pleasure pads made last month very pleasurable. They helped me retain my moisture and balance. Our Wash 'n' Wear Cloth Pads are comfortable, absorbent and leakproof making them an affordable solution for stress incontinence leakage. Stress incontinence affects 20% of women over age 40. Up to 40% of women over age 75 experience daily urinary incontinence. Studies have documented that about 50% of all women have occasional urinary incontinence. It is experienced by one in three mums over 30 and most women during pregnancy. In fact, right now 2 million other Australian women are nervous about coughing , sneezing or laughing unexpectedly. Even though stress incontinence is very common it is still embarrassing to experience bladder leakage unexpectantly. 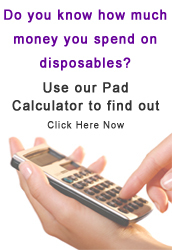 It can be expensive to have to be constantly buying disposable type pads and many women often suffer skin irritation because of the materials and chemicals used in disposable pads. 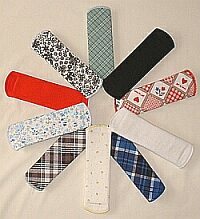 we originally designed our cloth pads as a body friendly alternative to disposable menstrual pads, but they work just as well for bladder leakage. How many pads per week? No irritation or chafing - Because Pleasure Puss cloth pads have natural cotton outer layers (the layers closest to your sensitive skin) you are not exposing yourself to the myriad of chemicals contained with disposable paper (and plastic) pads. 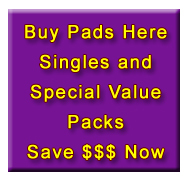 Super slim designs - Each Pleasure Puss pad is superslim making them comfortable to wear and discreet. You don't have to put up with any extra bulges where you don't need them. Superabsorbent - The ultra thin core and stay dry comfort layer make sure you stay drier. For incontinence needs - the pads are suitable for weak bladder problems and minor incontinence. Leakproof - Pleasure Puss cloth pads incorporate a special leakproof layer that runs the whole length and breadth of each pad ~ so you know you can rely on them to protect your clothing. Easy to Wash - Just soak, wash and dry. Variety of colors and sizes - Say goodbye to boring old white pads, now you can choose your pad colour or pattern to suit your mood. Secure fastening - for all types of underwear, from bikini briefs to larger styles. Pleasure Puss pads are width adjustable ensuring that your pad stays in one place. Simple one piece design - You don't need any other special underwear, clips, holders or any other accessories. So this saves you time - you don't need to waste time looking for the belt or inserts. Convenient - No more last minute dash to the shops - you always have pads on hand when you need them. Long Lasting and durable - You get your moneys worth.